Moscow is a city that I have wanted to visit for many years, the visa process, the politics, and a few other reasons are why it took so long to get here. I was blown away by how amazing Moscow is. We, Carmen, Nate, and I, got to the Kremlin by walking. We were unaware that the day we were there, the rehearsal for their victory day was going on, starting at Red Square. The streets were packed with people, entire blocks cordoned off, and every way to the actual Kremlin appeared to be blocked. We could not figure out how they would sell us tickets when it was closed. Nate was dragging, typical Nate, and we actually kept on walking when he stopped to purchase some Petruska dolls. Luckily, Nate was not interested in the Kremlin and ended up having a good day to himself. We got across the street from the Kremlin with no way to get in, so we decided to try the metro. We took it one stop, only to not be allowed off at that stop. We continued on to the next, only to see we were not allowed back on. It was a disaster, we were getting more and more worried we would not be able to get to the Kremlin. We eventually exited the metro, only to see an entire parade of military equipment and personnel going down the street, including jet formations flying above. It was amazing to see, almost worth missing the Kremlin for. Luckily, we walked back to the area across from the Kremlin, went down into the metro and showed our pre-booking to a police officer who promptly let us in. The parade, while slowing us down, did have the nice effect of keeping the Kremlin empty. We got our tickets and went in, first visiting the Armory. In the Armory, you are not allowed to take photos, so there won't be any of them here. The armory was filled with rooms of Catherine the Great’s objects: carriages, dresses, scepters and so forth. The main reason we wanted to go, though, was the Trans-Siberian Faberge egg. It was huge! A tiny train set that was on display fits inside the large egg. Nate, actually, ended up getting a tattoo of it. The rest of the Kremlin was outdoors and not as exciting as the Armory. As the parade ended it began to fill up more. We spend about an hour more before heading to Red Square and then a few blocks up to an absolutely amazing vegetarian restaurant, Fresh. We then had a long meander back to the hotel to turn in. Nate left the next day, which turned out to be a rainy and snowy day, so he really did not miss much. We opted to take the metro down south to a park and Tsarytsino Open-Air museum. We walked around the park in the rain until it was not really bearable anymore, then took a different metro line back into the city center and to Fresh again. When we got on the metro it was raining, when we got off the metro in the city it was snowing. 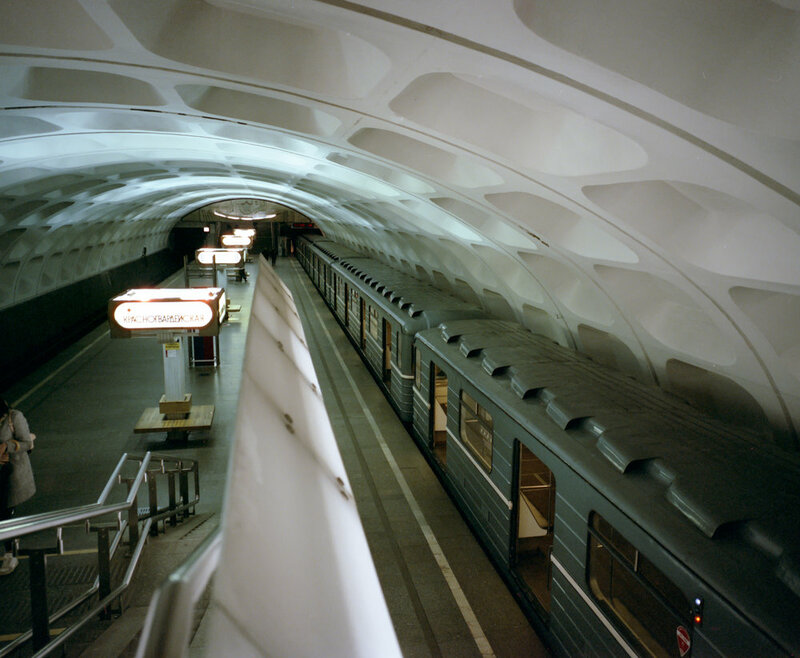 The Moscow Metro is one of the best metro systems in the world. It is extensive, cheap, on time, and frequent. The cars on the system of the quintessential Soviet model found all over former Soviet countries. Ukraine, Hungary, Azerbaijan, Belarus, and quite a few others still have this model. I think it is the coolest. We spent a lot of time using the metro to get around, as well as just using it as a thing to do. The trains are also painted in different paint schemes, which was neat. I only brought up the metro, as you really do not need to take a cab anywhere in Moscow, the metro is more than enough. Moscow is a world-class city, packed with things to do and see. Anyone who considers themselves a traveler or someone who just wants to see some of the best cities in the world needs to make it to Moscow. We only spent three days here however, it would be easy to spend a week and not visit the same place twice.